I’m skeptical about … strep throat. Strep is a bacterium meaning that it has a cell membrane, cytoplasm, DNA, and can replicate independently thereby rendering it susceptible to a host of antibiotics including penicillin. Viruses, on the other hand, lacking these same attributes do not respond to routine antibiotics. There are many varieties of strep including S. pneumoniae, the most common cause of pneumonia, but for the remainder of this post when I use the word strep, I am referring to group A beta-hemolytic strep, the bug that causes strep throat. Everybody, at one time or another, has awakened with a horrible sore throat, the feeling that you’re swallowing razor blades, and the fever and achiness that accompanies it–to use a sophisticated medical term, “Yecchh!” Sore throats are responsible for more than 15 million doctor visits annually. But how many of these sore throats are caused by strep and how many of them need antibiotics? Strep is rare before age 3 and uncommon after age 45. The peak incidence occurs in children between the ages of 5 and 15 with a seasonal prevalence that peaks during the winter months, although sporadic cases occur year round. It’s the bug that keeps on giving, as you can get strep over and over again. Recurrent strep infection is the leading indication for tonsillectomy in children. The incubation period (i.e. the time when a patient is not outwardly symptomatic but has active infection and is contagious to others) lasts for 2 to 5 days. About 10% of school age children harbor Strep pyogenes in their throats during winter months that will falsely trigger a + strep test. But here’s the rub; most sore throats aren’t caused by strep. In school-age children, strep is the source in just 30 to 40% of sore throats, while in adults the number drops to just 5 to 15%. So why are antibiotics still being used in two-thirds of kids and more than half the adults who visit their doctor for sore throat? When confronting sore throats there are 5 treatment options: 1) treat everybody, 2) treat nobody, 3) treat only those with clinical symptoms suggestive of strep, 4) treat only those with + strep tests, 5) use a combination of selected strep testing and empiric treatment. And here’s where the controversy heats up as the recommendations put forth by the Infectious Diseases Society of America, the American Heart Association, and the American Academy of Pediatrics don’t jibe with those of the CDC, the American College of Physicians, and the American Association of Family Practice, whose recommendations differ markedly from most European nations. Regarding the first option of treating everybody with a sore throat; this makes no sense since we know that the majority of patients with sore throat don’t have strep. Although some patients will benefit, overall there will be more harm due to antibiotic side-effects and antibiotic resistance. The second option of treating nobody with a simple sore throat actually does make sense since the overwhelming majority of sore throats are self-limited and resolve on their own. But failing to treat strep here in the States doesn’t go over well with patients or parents despite the fact that penicillin reduces the total duration of strep throat symptoms by less than a day. More than 90% of both treated and untreated patients are asymptomatic by a week. The benefit of penicillin in symptom reduction is likely the same as doing simple things like taking ibuprofen, drinking plenty of fluids, and gargling with salt water. How about the third option of only treating those with symptoms strongly suggestive of strep? Dr. Robert Centor noted that certain symptoms increase the likelihood that a sore throat will be strep-related. They include: the presence of fever; exudate (yucky white stuff on the throat or tonsils); swollen, tender lymph nodes in the neck; and the absence of cough. Several large prospective studies have looked at the accuracy of these predictors and found that if none of the findings are present then the likelihood of strep is low, on the order of 1 to 2% while if all the criteria are present that number increases to between 51 to 53%. While the strategy of treating based on clinical symptoms alone does reduce the use of unnecessary antibiotics in patients with viral sore throats, it also guarantees that some patients with strep will go untreated. Is that a big deal? It used to be. Back in the 1940’s, during a particularly horrific outbreak of strep at Warren Air Force Base, more than 2% of those infected ended up developing rheumatic fever, a particularly dangerous complication involving the heart and other organ systems, sometimes leading to destruction of the mitral valve. Treating strep throat with penicillin for 10 days reduces the risk of this complication by roughly 75%, and for decades afterward this provided the rationale for testing and treating strep throat. But the run-of-the-mill strep we see today is not our grandparents’ strep. Over time the germ has become decidedly less virulent (wherein virulence is defined as the capacity of an organism to cause disease). While 120 years ago, outbreaks of scarlet fever had a mortality rate as high as 30% in kids, it’s now just strep throat with a rash. Similarly, the incidence of rheumatic heart disease following a routine strep infection now stands at less than 1 per 100,000, a number so low that the CDC stopped tracking this complication more than 20 years ago. While some bacteria, like the skin staph known as MRSA, have become more virulent, strep has moved in the other direction. To prevent 1 case of rheumatic heart disease today requires treating more than 133,000 kids with penicillin, a number expected to result in more than 13,000 cases of diarrhea and 2 to 3 deaths due to fatal allergic reactions. Nor has treatment been shown to reduce the incidence of kidney complications associated with strep. Treatment in my daughter didn’t prevent her from developing glomerulonephritis as a 13-year old (an illness from which she eventually recovered after blowing up like a toad). What about the fourth option of only treating those with + strep tests? The newer rapid tests are pretty accurate but falsely positive in kids colonized with strep, and falsely negative in kids where not enough strep is collected on the swab. I must add that kids don’t like having their throats swabbed, and it’s tough to get a thorough swipe in a kicking, crying, puking, 3-year old. Knowing this, some guidelines recommend that all negative rapid tests be followed by a formal throat culture, whose results typically come back in 1 to 3 days. Is it worth it? Walgreens’ Healthcare Clinics charge $17 for a rapid strep test; CVS’s Minute Clinics charge $30; while most urgent care centers charge between $40 and $50. The cost is even higher in the ER where a rapid strep will set you back $130. If the rapid test is negative and the doctor adds a formal throat culture to the list (as per recommendations from the Infectious Diseases Society of America) then add another $140 to the bill. This doesn’t include the physician or facility charges. According to the website Wise Bread, typical urgent care centers charge $111 to treat strep throat, while the average ER bill comes to $531. Wow!—that’s a lot of dough to decide whether or not to allocate $4 for penicillin to treat a self-limited condition that almost always goes away on its own. So let’s consider the last option; empirically treating those with all 4 of the Centor criteria (fever, exudate, swollen lymph nodes, and no cough), not treating those with none of the criteria, and selectively using strep testing in the rest. This makes the most sense to me, although I would argue that formal throat cultures costing hundreds of dollars are never indicated for routine sore throat. In this case, I disagree with all of the US medical societies and believe the Brits have it right. Their guideline recommends treating based on the history, age of the patient, and the presence of clinical symptoms alone, with no routine strep testing. If your doctor does decide to treat you, there’s no evidence that the fancy, new, more expensive antibiotics work better than penicillin. Strep is a dumb bug with a resistance rate of about 10%, nearly the same as 50 years ago. If you’re penicillin allergic then clindamycin or Keflex are suitable alternatives. Although Zithromax is frequently prescribed for Strep throat, it is not a first-line agent, requires a higher dose than for ear infections, and carries with it an unacceptably high rate of resistance. Final thoughts: If you have a bad sore throat, go ahead and see your doctor, even get a rapid strep test if you want, but know that using penicillin (even the shot) will get you better only marginally faster than simply gargling with salt water, drinking plenty of fluids, and taking fever medicine. If your throat is so swollen that you can’t swallow, there’s good evidence that a slug of steroids will help, so don’t forget to ask for them. In the meantime, stay healthy my friends! 1) 100 kids with a sore throat. 2) 100 rapid strep tests: 37 will be (+) and 63 will be (-). 3) No initial treatment in 63 kids. Here the IDSA recommends follow up throat cultures for all kids with (-) rapid screening tests. 4) 63 throat cultures: 3 will be (+), 60 will be (-). 5) Total screening and treatment costs of 100 kids with sore throat to correctly treat 30 children with strep and to incorrectly treat 10 children colonized with strep: $13,980.00. This is nuts!! **Assuming an average urgent care charge of $50 per rapid strep test, $140 per throat culture, and $4 per penicillin prescription. This does not include physician and facility charges of at least $100 per patient screened. Note that ER charges will be 2-3x’s higher. 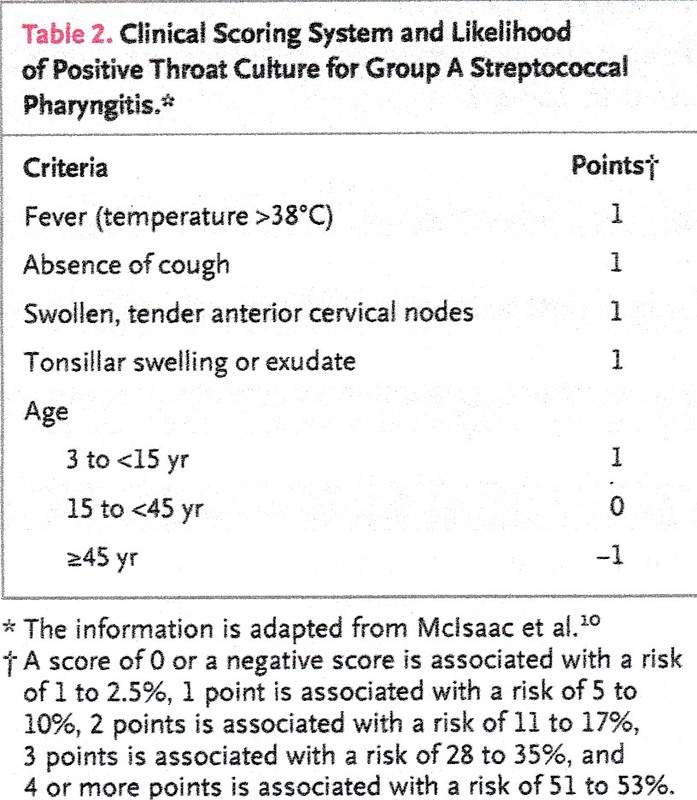 Michael Wessels, “Streptococcal Pharyngitis,” NEJM 2011; 364: 648-55. Stanford Shulman et al., “Clinical Practice Guideline for the Diagnosis and Management of Group A Streptococcal Pharyngitis: 2012 Update by the Infectious Diseases Society of America,” Clinical Infectious Diseases 2012; 55: e86-e102. Beth Choby, “Diagnosis and Treatment of Streptococcal Pharyngitis,” Am Family Physician 2009; 79 (5): 383-90. Elena Chiappini et al., “Analysis of Different Recommendations From International Guidelines for the Management of Acute Pharyngitis in Adults and Children,” Clinical Therapeutics 2011; 33: 48-58. Jeremie Cohen et al., “Selective Testing Strategies for Diagnosing Group A Streptococcal Infection in Children with Pharyngitis: A Systematic Review and Prospective Multicentre External Validation Study,” Canadian Med Assoc Journal 2015; 187 (1): 23-32. This entry was posted in Uncategorized and tagged pharyngitis, sore throat, strep throat, tonsillitis. Bookmark the permalink. ← I’m skeptical about … concussion. Walgreens does not charge $17 for the fast strep test. You have to find a Walgreens clinic, and they consider the 5-minute fast strep “an office visit”. The charge is $89 if you don’t have insurance. CVS runs their at-retail clinics the same way. It is an office visit and costs between $99 and $139 if you don’t have insurance. The web site says $35, but you have to pay for an office visit to get the fast test. These prices — and the time sunk in waiting in a CVS/Walgreens — are absurd, especially since you can buy the fast-test over the counter. Neither CVS nor Walgreens sell the fast-test strips. You can buy Level Strep A Test Strips. In-store at Walmart. Online at Amazon or other online medical vendors. You get 25 strips for $30-$35. It takes the same five minutes, at home. Yes, the prices change almost daily and everything costs more than it should. Bottom line: strep tests and antibiotics are generally unnecessary, as strep throat is almost always a self-limited illness that resolves whether or not antibiotics are used. Penicillin shortens the duration of symptoms by about a day, but if your throat is covered with white yucky stuff and you can’t swallow, a shot of penicillin and one of Decadron (a steroid to reduce swelling) will help you feel better faster. The strains that once caused rheumatic fever are now so rare in the US that it is no longer tracked by the CDC. Fatal allergic reactions to penicillin are now more common than deaths due to strep throat, so a case can be made that antibiotics shouldn’t be used at all for this disorder. I took my son to our pediatrician’s office for a walk-in strep test in September when he had a sore throat and tummy ache. We went straight to their lab, where his throat was cultured. We did not see a nurse or a doctor. The pediatrician’s office charged $521.55 for that 5 minute visit, of which we had to pay about $100.00 of that. Insane! He has had scarlet fever in the past, however, after a 10 day dose of antibiotics did not work on his strep throat and he then had to do another 10 day dose. I also had scarlet fever as a kid. So it does still exist. Regarding scarlet fever, its occurrence is on the rise, at least in the UK where the incidence is still tracked. Currently, the CDC does not track its occurrence in the US. (Do not confuse scarlet fever with rheumatic fever–although both are caused by strains of Strep, they are very different illnesses.) The rash of scarlet fever is typically described as a having a fine sandpaper-like texture, seen in conjunction with a strawberry-red tongue. This disease, once a feared pediatric illness (Abraham Lincoln, Charles Darwin, and John D. Rockefeller are among those whose children succumbed to it), no longer poses much of a threat, and can generally be regarded as “Strep throat with a rash.” The virulence of the bacteria responsible for it has markedly declined over time. As to the cost of testing and treating it, all I can do is shrug my shoulders and agree. It’s outrageous. This is a great article. Thanks for the information about the decreased virulence of the modern strep bacteria. I had not heard that before, and it definitely makes me rethink the current testing and treatment regime. One issue you didn’t address is absence from school. Once kids are on antibiotics for 24 hours, they are allowed back into school since they are apparently much less contagious at that point. If we do not give them antibiotics, how long would they need to be out of school? Or would they go back to school anyhow and be contagious? I have made two trips to the Target Minute Clinic in the past few months for strep checks. In both cases, about 2 months apart with different kids, the rapid test was negative but we received a call in a day or two that the cultures were positive. The false negative rate for the rapid strep is often cited as 5%, so something seems wrong. Once, sure, but twice? (The odds are 0.25%, if I am doing the math right.) Are they doing the test improperly? Has the test itself changed in some way or the quality of its manufacturing in recent years? You raise some good questions for which there are pretty good answers. Regarding the duration of contagiousness to others, a nifty little study from 2015 looking directly at this issue found that more than 90% of school-age children with a positive rapid Strep test given a single dose of oral Amoxicillin were negative when retested between 11 and 23 hours later, meaning that kids treated early in the day may return to school the following day as long as they feel better [Ped Infect Dis J 2015; 34 (12): 1302]. Regarding the duration of contagiousness if NOT treated, there are no studies looking directly at this, but the general consensus is that you remain contagious while having active symptoms of fever and sore throat. Since the vast majority of Strep sore throats are better within 3 to 7 days (with or without antibiotics), untreated Strep likely remains contagious to others for roughly the same duration of time with the highest risk early in the course when symptoms are at their peak. The false negative rate of rapid Strep testing is on the order of 10%, usually due to technique wherein the person obtaining the specimen simply does not swab long enough or vigorously enough to obtain an adequate specimen for testing. (I admit to having witnessed, on more than one occasion, nurses performing a single, cursory jab at the back of a squirming child’s throat when obtaining a rapid Strep test, a sure way to a false negative result.) On the other hand, there are relatively fewer false positive/false negative results associated with a formal throat culture, so you can generally trust the result. Remember, however, that a sizable percentage of school-age children are colonized with Strep and will ALWAYS have a positive culture, even in the absence of symptoms. The way to determine if your child is one of them is by obtaining a culture when your child is completely symptom free. Since these kids invariably become recolonized after repeat exposure there is no reason to treat them unless it is to offer temporary protection against a Strep infection to an immunocompromised household contact. In addition to severe anaphylaxis, there’s also the need to go to the doctor’s office and potentially spread your infection to get the antibiotics. On the other hand, a severe cough or other serious strep-like symptoms should also get checked out. Maybe a mobile treatment model would cut down on this issue…. Regarding the duration of contagiousness if NOT treated, there are no studies looking directly at this, but the general consensus is that you remain contagious while having active symptoms of fever and sore throat. Is there then no reason to believe that, assuming my symptoms have left, I would be contagious to others for significantly longer, so as to warrant taking antibiotics? Also, any idea where this 2-3 week number came from in for absence of actual studies? If you are at the tail end of your illness and no longer have fever or significant throat pain, then your risk of transmission to others is quite low, and likely nonexistent. This is NOT an indication to take antibiotics, as you are clearly getting better without them. The only exception might be if you have a close household contact who is markedly immunocompromised (e.g. a cancer patient on chemotherapy). Although all common winter illnesses (colds, coughs, flu, Strep etc.) are contagious, the risk of becoming clinically ill after a single exposure is not very high. For example, during my last shift I evaluated more than a dozen patients with colds, coughs, Strep, and flu and yet remain quite healthy. I anticipate seeing another dozen or more tomorrow. Wash your hands, cough into your elbow, don’t share utensils, and avoid open-mouthed kissing until your symptoms fully resolve. There is no literature to support the notion that people remain highly contagious for 2-3 weeks after a simple cold or Strep throat (treated or not). This is just another example of mythology in medicine. Lastly, Strep is an uncommon cause of sore throats in adults, responsible for only about 10% of cases.